Manhattan, NY Macklowe Properties is nearing the completion of construction on 200 East 59th St., a 35-story residential condominium that continues the development company’s tradition of pushing the boundaries of classic modernism. The tower at 200 East 59th St. stands at the intersection of Midtown and the Upper East Side, close to Central Park and rooted in the shopping district that includes Bloomingdale’s, the Decoration & Design Building and the boutiques of Madison and Fifth Aves. With its wraparound terraces and exterior columns that create a unified visual rhythm, the building is a follow-up to Macklowe’s 432 Park Ave.
Real estate brokers and buyers can now experience the building’s architectural hallmarks and expansive views of Central Park, the Queensboro Bridge and the Midtown skyline for the first time, via two completed and fully furnished residences on the 22nd floor open for viewing by appointment. 200 East 59th St. is the first new residential tower in New York to bring true indoor/outdoor living to every residence. All 67 homes are corner units, and take advantage of terraces that vary from 7 ft. deep to 12 ft. deep. These outdoor rooms – from 22 ft. long to 150 ft. long – are seamless extensions of the main living spaces, separated by floor-to-ceiling walls of glass with slender framework and no horizontal interruptions to virtually eliminate the visual distinction between indoor and outdoor space. The residences’ column-free layouts are a sophisticated engineering solution that extends the building’s floor plates and creates flexible and architectural interiors, while also adding unique extra space to each home. The columns have been pushed out to the building’s exterior, puncturing the terraces and becoming a focal point when viewed from the outside. At 200 East 59th St., the structure itself is the architecture, and is proudly on display: The portion of each column facing the city will be illuminated at night, creating a stunning visual. “We’ve taken the best design elements and lessons we’ve cultivated over our decades of experience and created a building with integrity, one that is gentle and welcoming, with views that can not only be enjoyed, but experienced,” said Harry Macklowe, founder and chairman of Macklowe Properties. Visitors to 200 East 59th St. will note the same obsessive attention to detail and well-executed design as Macklowe’s 432 Park Ave. – including parallels in the kitchen and bathroom designs, materials and finishes, and residence controls and systems – at a far more accessible price point. Consisting primarily of one- and two-bedroom residences, with three full-floor penthouses also available, the residences at 200 East 59th Street are currently priced from $1.875 million to $17.96 million. Containing just 2-3 residences per floor, the building provides a high level of privacy and intimacy. Floor-to-ceiling insulated glass walls block out all sound from outside, and ceiling heights range from 10’ in most residences to 14’ on the building’s top four floors, including all three penthouses. 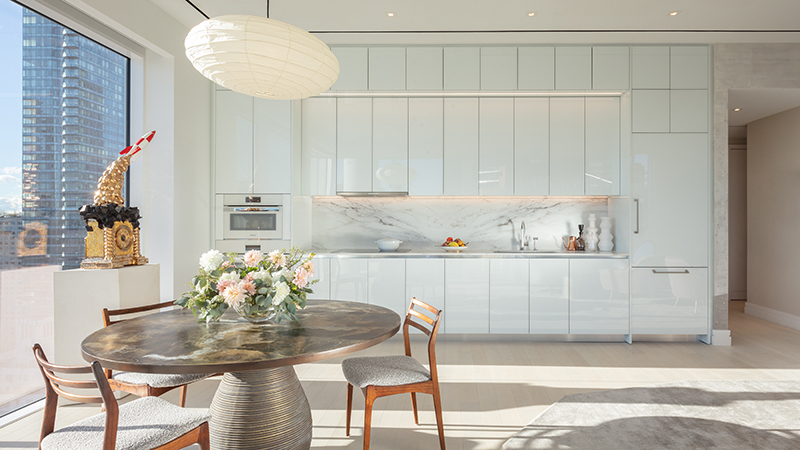 Interiors are finished with white oak plank flooring, white Calacatta and Siberian white and mink marble, and the windowed open kitchens feature integrated white glass Miele appliances and custom Italian white glass cabinetry. The condominium is a 24-hour, full-service building with an on-site resident manager, doorman and a full-time in-lobby concierge who will offer residents a range of bespoke services including home management assistance, lifestyle and wellness recommendations and reservations, and travel accommodations. All residents will enjoy a host of amenities including a double-height white marble lobby, fitness center, lounge, and private dining room with marble fireplace and catering kitchen, and a landscaped outdoor terrace. A separate laundry room with commercial oversized washers and dryers is on the premise, as is bicycle storage. The completion of the first residences marks a major construction milestone for the building, with exterior construction nearly complete and initial occupancy on track for early 2019. Sales and marketing for the residences at 200 East 59th Street is being led by Douglas Elliman Development Marketing. The building is designed by Macklowe Properties with CetraRuddy Architecture.